Last week sometime I started working on menus for dead people. That is, what I would cook for people that I like who happen to be dead – if they were alive. Because sometimes I’ll take inspiration where ever I can get it. I was halfway through a cabbage gruel menu for Emma Goldman when I realized that there are people among the living who inspire me. People who might actually appreciate the recipes. People who might not live at the turn of the 20th century and live on cabbage and potatoes. And so this is the first of what I’m calling Virtual Dinner Dates. Now, I’ll admit that the cranberries sound a little out of place – but they aren’t adding a strong cranberry taste, just a little bit of tanginess, along with the lime, to contrast with the nutty sweetness of the pumpkin. But this isn’t a sweet dish per se, it’s savory with the garlic, onion and pumpkin and pulled together with creamy coconut milk. Top it off with spicy, crunchy toasted pumpkin seeds to fancy it up. I always like to use the seeds from a pumpkin because it feels like you’re a survivalist using the whole animal. First the pumpkin needs to be roasted. I would suggest doing this well in advance of preparing the risotto for two reasons. One, you’ll need it to cool down so you can peel and chop it. And two, that way it doesn’t seem like you’re cooking for so long and the actual risotto takes only about 35 minutes. If you’re using pumpkin you can also roast the seeds to use as a garnish. Yeah, you can roast the seeds of other squashes, I just don’t think they taste very good. So. To prepare the pumpkin and seeds: Preheat oven to 350 F. Hack pumpkin in half and remove the seeds and stringy bits with a tablespoon. Reserve the seeds and place them in a colander to clean. Lightly oil a baking sheet and place the pumpkin face down on sheet. Bake for about 35 minutes, or until easily pierced with a fork, but not completely mushy. Once cooled, peel off the skin and chop pumpkin into bite sized pieces. In the meantime, wash the pumpkin seeds and dry completely with a kitchen towel. Place on a baking sheet and sprinkle lightly with a little olive oil, toss to coat. You can toast them in the oven while the pumpkin bakes, it usually takes about 15 minutes. Toss once or twice. Remove from oven and place in a bowl to cool. Once cooled, sprinkle with the spices to coat. And now and only now, are you ready to actually start the risotto. Have your broth ready and warming on the stove before you begin. Preheat a heavy bottomed pot over medium heat. Saute the onion, garlic, ginger and chilies in the oil for about 7 minutes, stirring often so you don’t burn it. Add the risotto and stir to coat with oil. Add wine to deglaze the pot, then add first cup of vegetable broth. Use a wooden spoon to stir until most of the water is absorbed. You don’t have to stir the entire time, just as frequently as you can stand. Continue adding veggie broth then stirring a few more times, until only a cup of broth is left. When you’re at the last cup, add the pumpkin and cranberries and repeat stirring. When most of the liquid has absorbed, add salt, nutmeg, cinnamon and lime juice. Stir in coconut milk. Cook for about 10 more minutes, stirring occasionally. Taste and adjust salt. At this point you can also add a teaspoon or so of agave. This doesn’t make it sweet per se, it just enhances the natural sweetness of the squash and cranberries. Let sit for about 10 minutes before serving, to let the flavors “marry.” Scoop into bowls and garnish with pumpkin seeds. is there seriously a squash called “butterbut,” or is that just my new favorite typo? Ha, I don’t want to fix it! OK, I have every single ingredient in this recipe so that must mean that I should try it. I am a little weirded out by the cranberry but I trust you! So this better be good! How spicy is it by the way? Tegan – it is spicy but since the seeds are removed it isn’t extremely spicy. Like, I think my mom could handle it. If you’d like it burn-your-mouth spicy, leave the seeds from one of the chili peppers intact. That is all of my favorite things in one recipe. Can’t wait! And I thought the Emma joke was funny even if no one else will give you love for it. Isa, thank you so much for this delicious dish! When you invited me to be your virtual dinner guest, I was so surprised and excited that all I could do was sputter something about berries and hot peppers in response to your query about my favorite ingredients. Truly, my mind went blank at the idea that the fabulous Isa Chandra would be cooking for me, if even only virtually. I couldn’t even remember my favorite foods! I felt kind of bad about that but I should have known that you’d come up with something sumptuous, no matter how paltry my contribution. But of course now I’m nervous because my grandmother didn’t raise me to eat at somebody’s house (or blog) without reciprocating, and that means I have to have the audacity to cook for you. You’ll be getting your invitation to dine at SuperWeed soon! PS — You inspire me too. Drew – thanks, you’re the only one who GETS me. pattrice – I’m so excited to see what you come up with! As long as there’s no celery or baby corn I’m sure I will love it! Also, I know you said arugula, too. I tried to squeeze it into this dish but it seemed like I was trying too hard so I just left it out. Wow. What a great recipe!! I’ve made it a few times with alterations, including tonight, using dried cherries instead of cranberries (I’m in France and my friends thought it was out of this world! They’d never had cherries in a dish like that before. Cranberries are hard to find). Beyond Pie: 10 Great Savory Pumpkin Recipes : Eat. Drink. Better. dear. god. this is awesome. supremely delicious. thank you so much! At the moment, I happen to have an abundance of pumpkin, red chilies and cranberries on hand so this looks like the recipe for me. I have a passion for pumpkin but really love to work it into savory dishes, not just sweet stuff. Just wondering though … I have 3 lbs. of fresh cranberries sitting on my kitchen counter. Can I use fresh instead of dried? Of course I could pop ’em in the dehydrator first, but they came out rather … odd … the last time I tried it. Man, this is simmering on the stove right now and my only regret is that my housemates are asleep and I couldn’t do the lime in the coconut song/dance! Very tasty 🙂 and I finally included the pumpkin seeds (although I had to substitute cumin, chilli seeds and turmeric), sooo delicious! IsaChandra, you have a GREAT site! WOW! I just happened upon your site today and I’m thrilled that I did… I’m excited to try your recipes and can’t wait to see what you come up with next. I’m your newest fan. 🙂 Thanks! HI Isa. 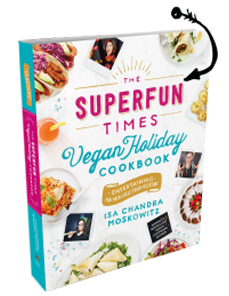 Living mostly off of your recipes in Veganomicon and this website has made me feel like a super-stalker. Just thought I should let you know that! This is EXCELLENT!!! But now I have to figure out if I need to wake up my roommate or not. This really is a wonderful dish. I made it for a couple of meat lovers and they couldn’t stop eating it. It will be on my Thanksgiving table next week! I don’t keep dry white wine in the house. Is there something else I could substitute? Thanks. Made this about a month ago and was blown away! I didn’t change a thing when I made it again today for my Thanksgiving dinner. Perfection. LOL the comment about the ‘butterbut’ squah was EXACTLY the laugh i needed tonight while menu planning! This is definitely going into my biweekly menu plan! (part of me wishes you had not changed the typo ;)) PS – LOVE LOVE LOVE your books! I ask for multiple ones every christmas, and since the only one i don’t have is your pie book…. I’m going to have to give my hubby a hint or two 😉 THANK YOU!! Delecious! I made this tonight and everyone enjoyed this dish. Perfect, loved it. I had one of those other squashes (can’t remember the name but its round and greenish but not acorn) so the seeds didn’t toast nicely. I substituted sliced almonds. Thanks again for another easy and delightful recipe. I made this for Thanksgiving dinner last year and it was a huge success! Many requests for me to make it again this year– can’t wait!! Thank you PPK! So I thought this was a very tasty, comforting meal. However, my husband did not like it nearly as much as I did. Difference in taste. BTW, for those that asked how many servings this makes – I halved it and probably had 4 servings. Loved it. Fascinating combination of sweet and spicy and tart. I love adding to my vegan risotto collection. I never cared for risotto at all until I met the vegan ones : ) THANK YOU. My husband is Italian and he thinks he makes the best risotto. We just made this (well, I did) and we love it. He’s officially banned from making future risottos. This recipe looks amazing! Will it be enough to serve 6 people? I’d like to make it for a dinner party tonight! Made this tonight, very tasty! 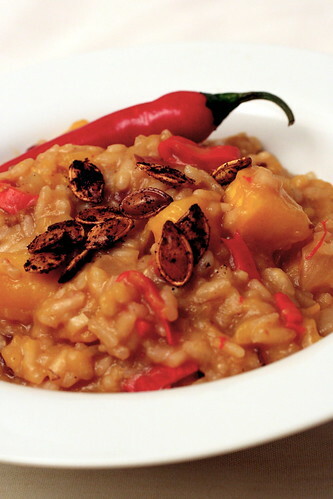 I just made this again…it is my go-to fall risotto recipe! Still as delicious as when I made it 7 years ago! I was a little scared about making this recipe because it is so different and new from what I’m used to. But I am sure it will turn out great. I am still working on making it now. My uncle is worried about it not going well. He’ll see, and I hope it is a great recipe for the holidays. 🙂 I like the addition of the pumpkin seeds!